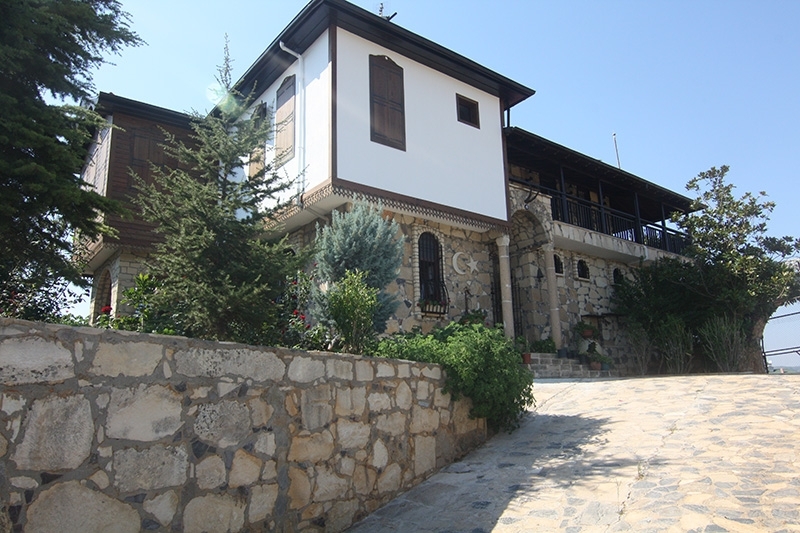 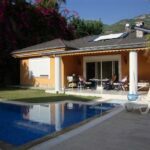 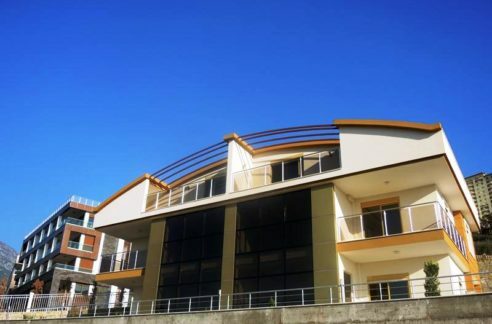 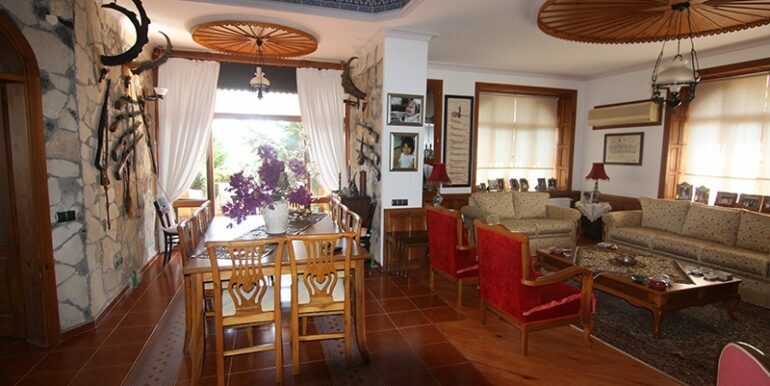 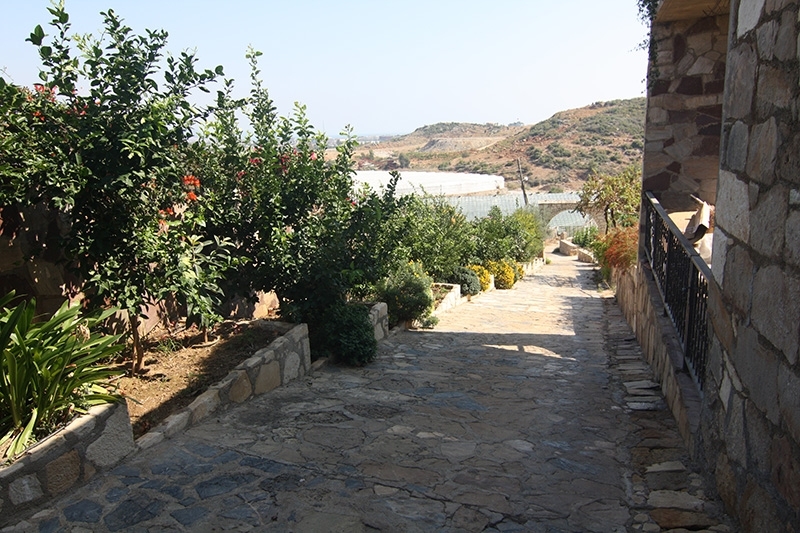 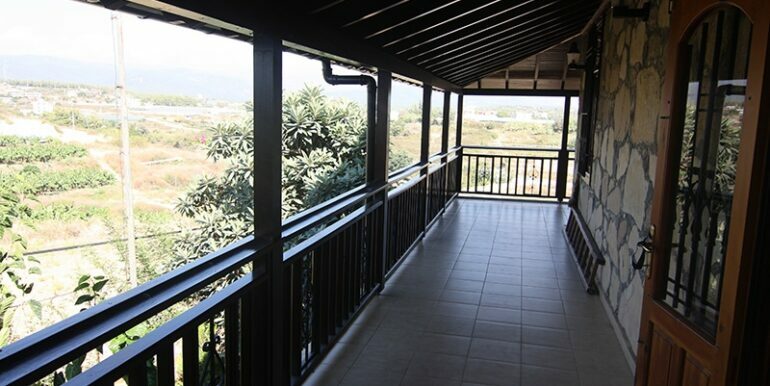 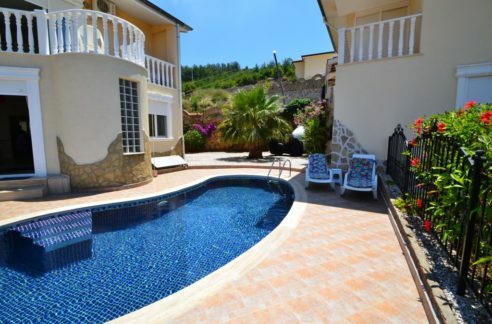 This villa was built in 2001 on a plot of 1450 m2, and villa itself has a capacity of 500m2, consisting of 3 floors.The beautiful drive way with private covered car park area takes you to the front door where you go into the spacious entrance with guest toilet and direct access to a spacious living room (70m2) with many interesting corners and an nice terrace surrounded with lots of plants and flowers. 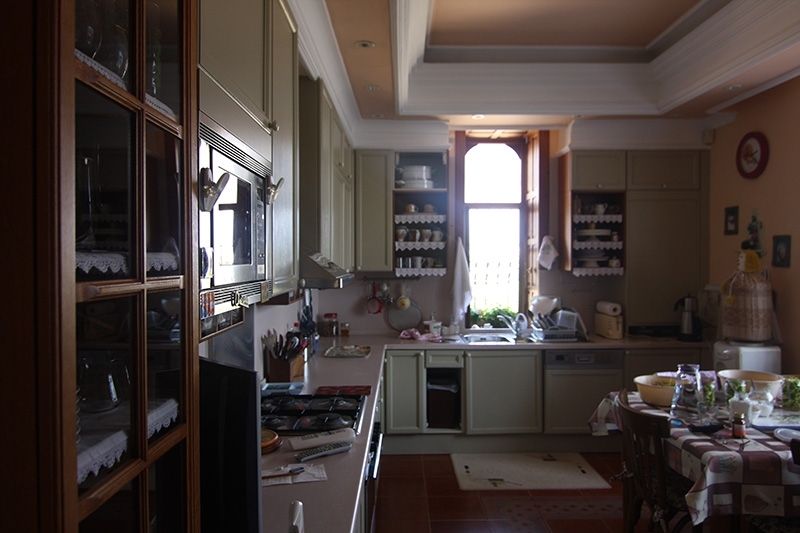 There is a large spacious kitchen with a very cozy ‘ inviting to sit appearance. 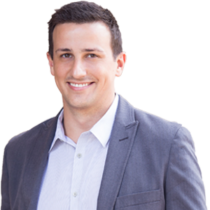 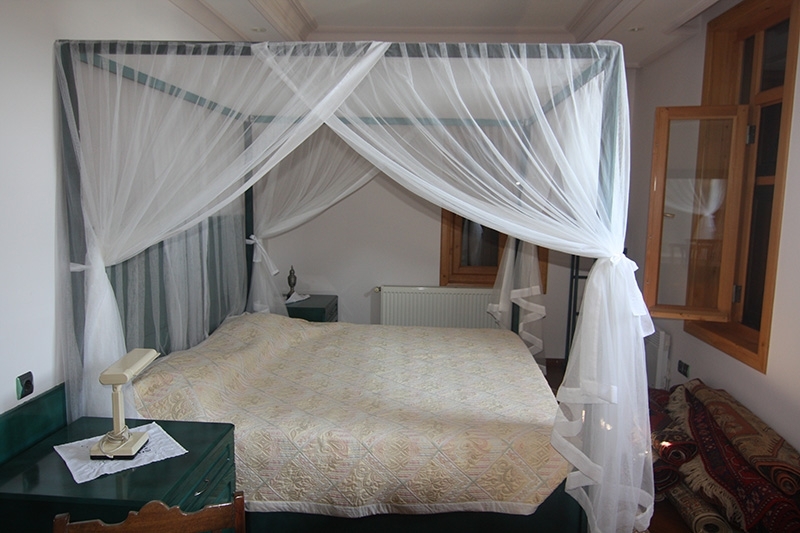 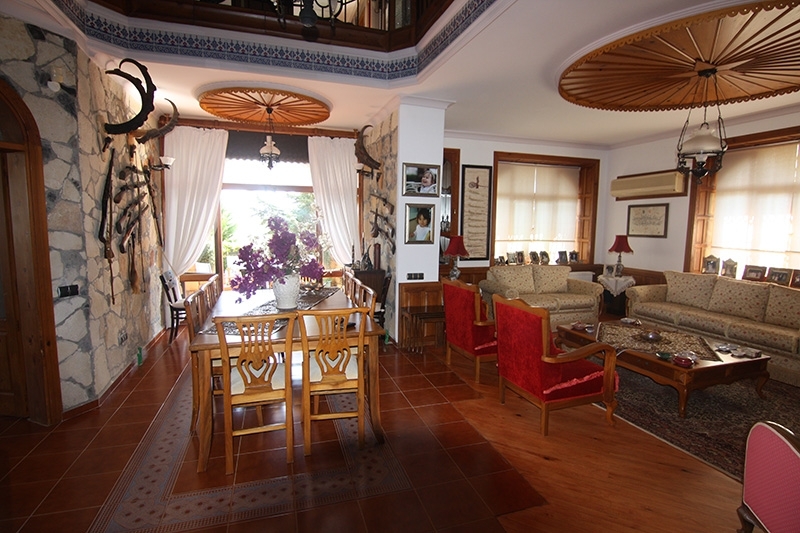 ‘ Further there are 2 large additional rooms that can be used for different use as a study, tv room or as a extra guest room, both of the rooms has a private bathroom. 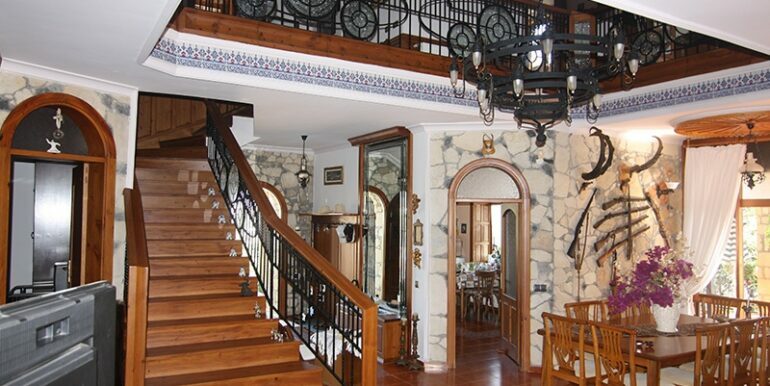 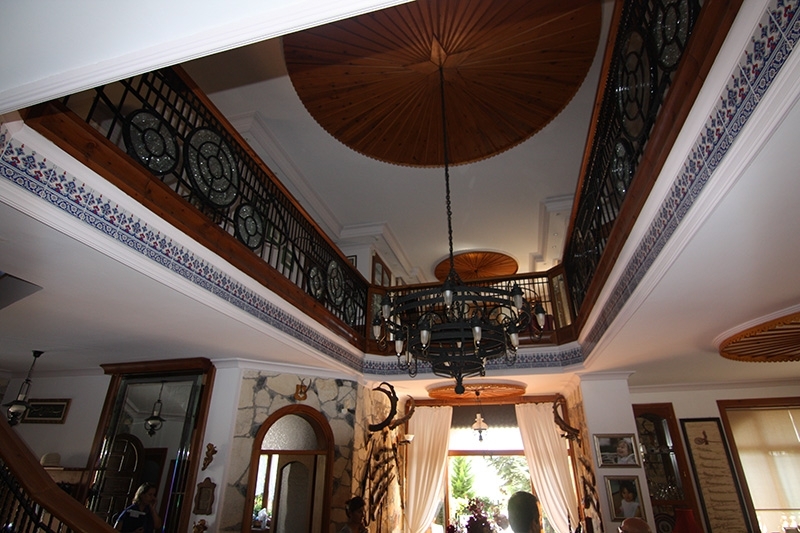 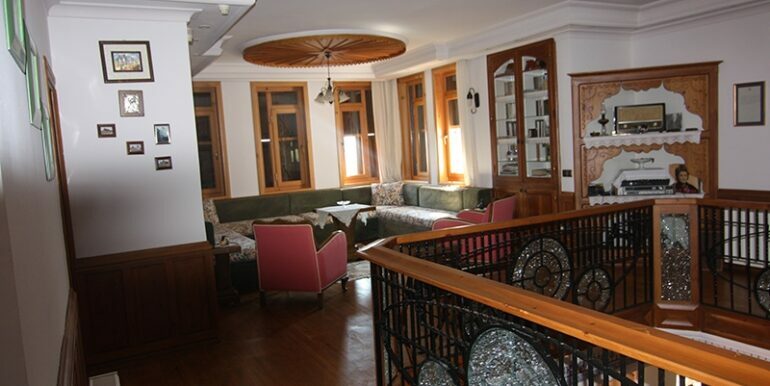 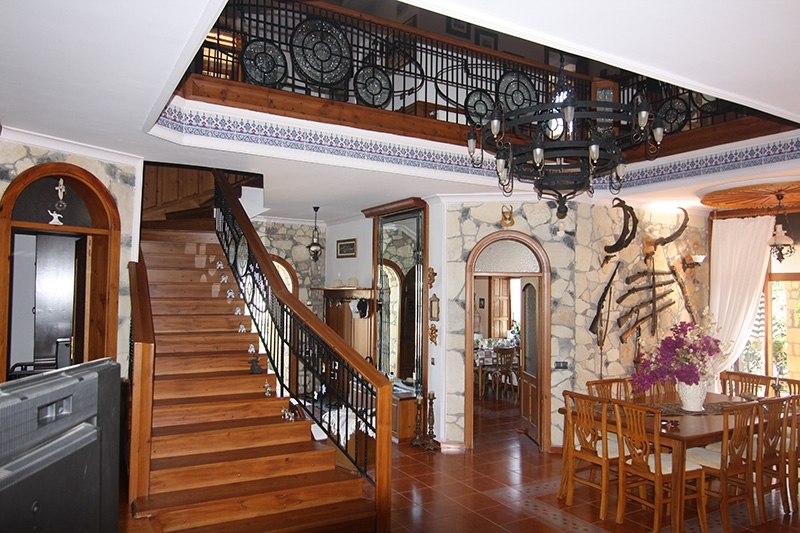 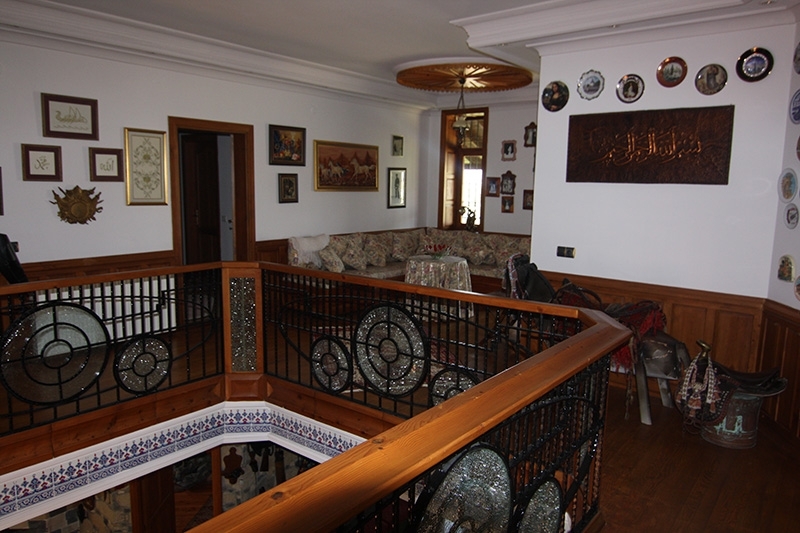 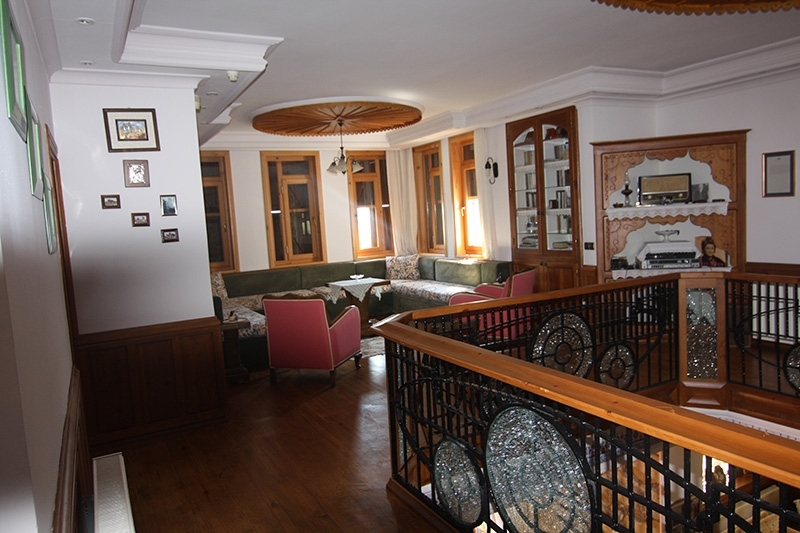 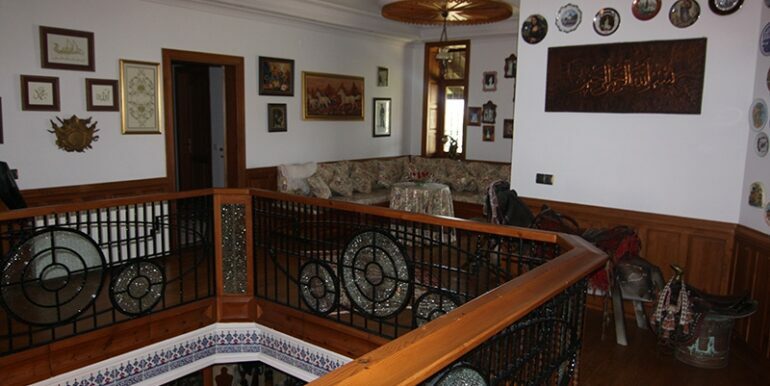 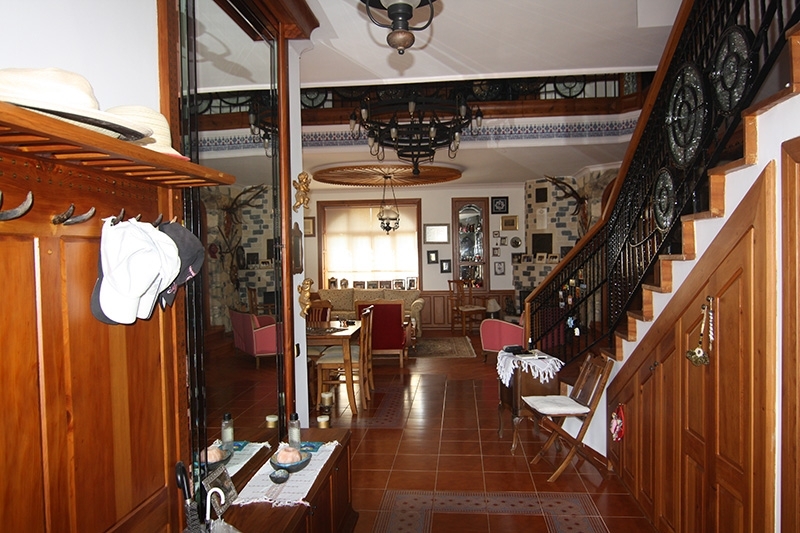 The large wooden stairs brings you to the first floor and is surrounded by an open balustrade joining a wooden traditional balcony sitting area. 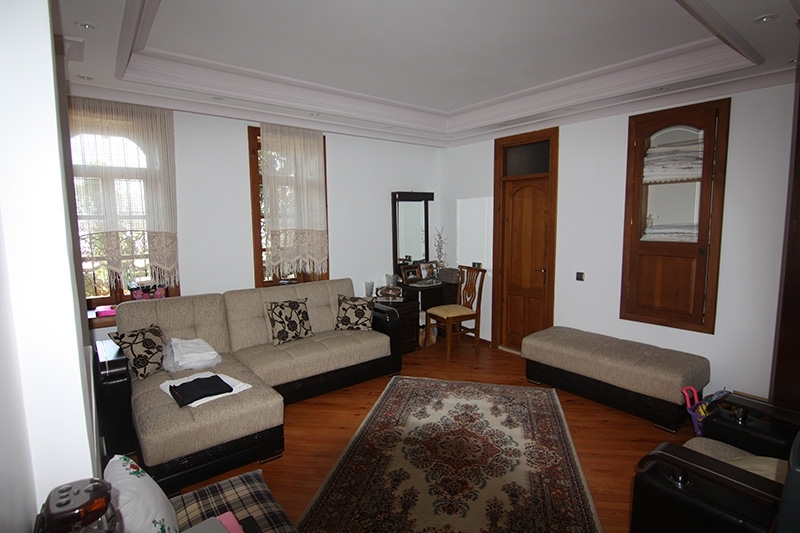 On this floor (200m2) there are three bedrooms, one masterbedroom with a fireplace and an ensuite bathroom with bath, shower and toilet. 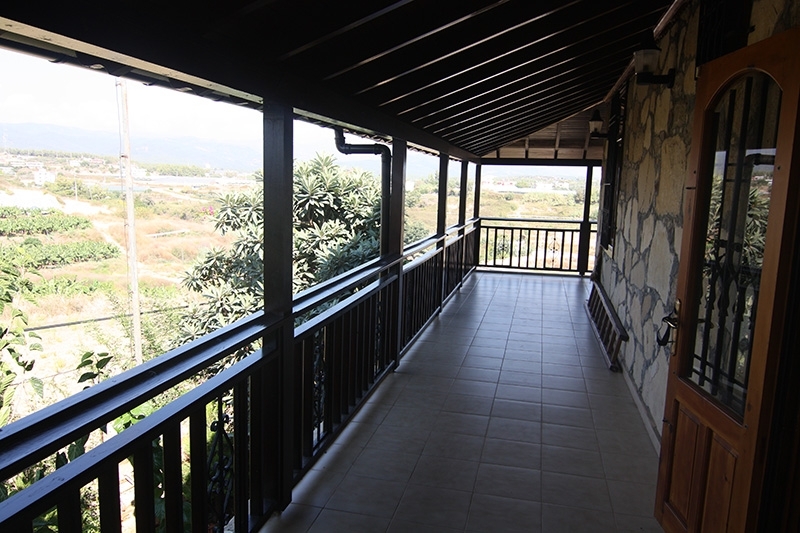 The other two bedrooms have private bathrooms with both shower and toilet. 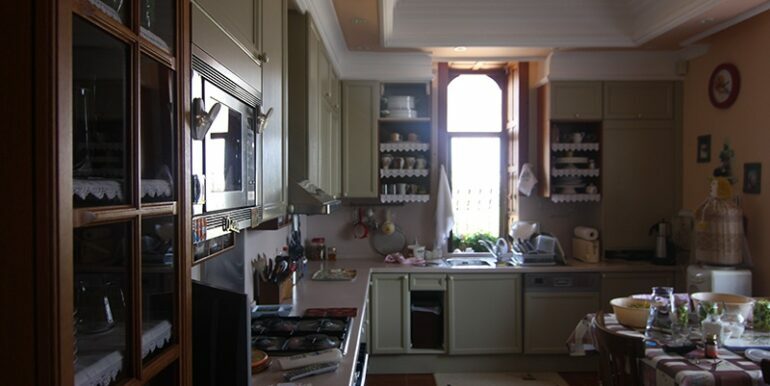 Downstairs is a basement (100 m2) which serves as laundry and general purposes as an extra kitchen and workplace. 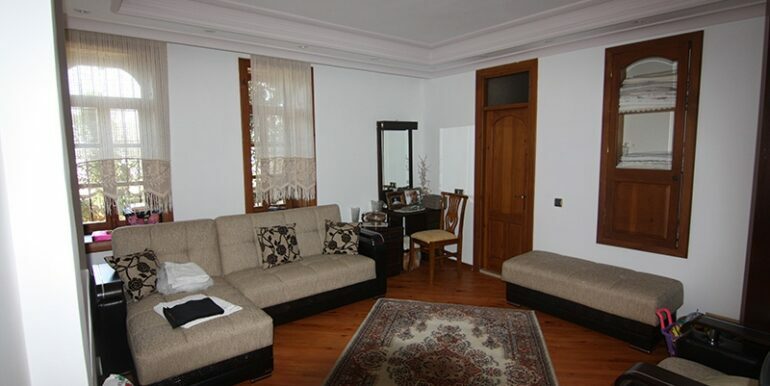 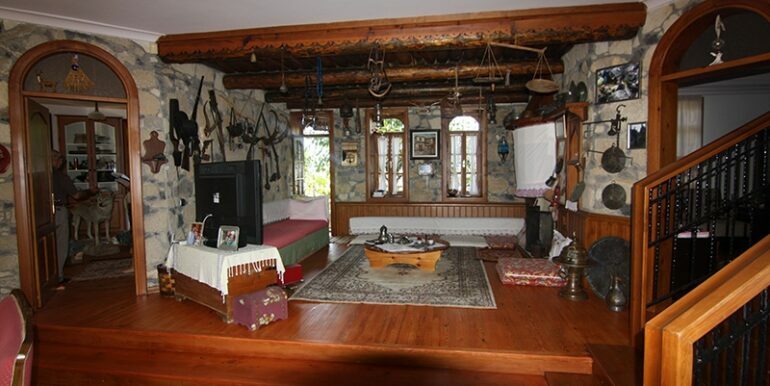 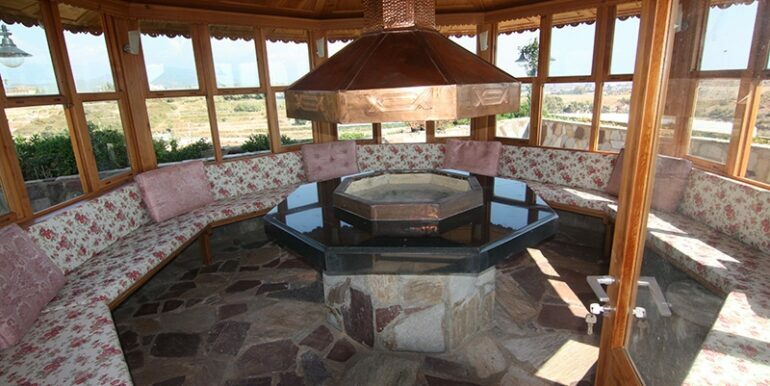 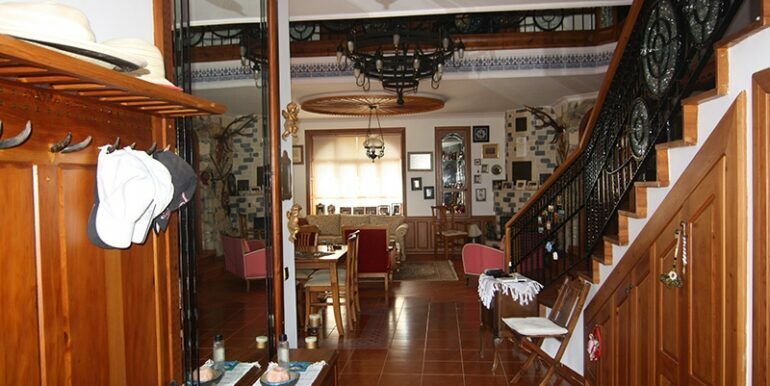 The whole house is equipped with both floor and electric heating. 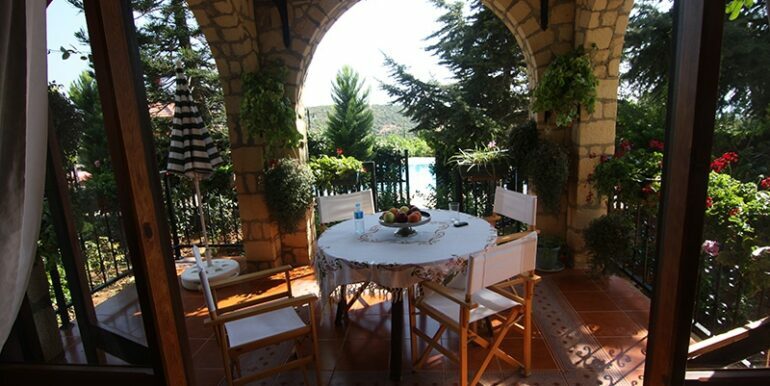 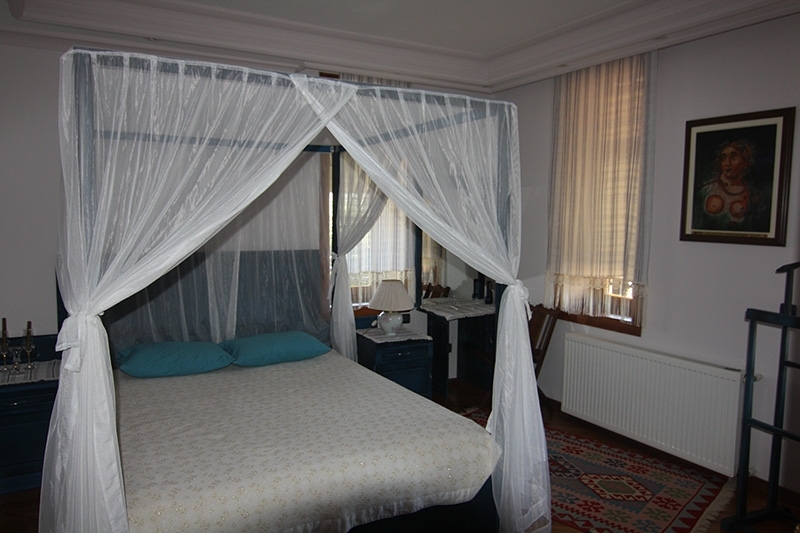 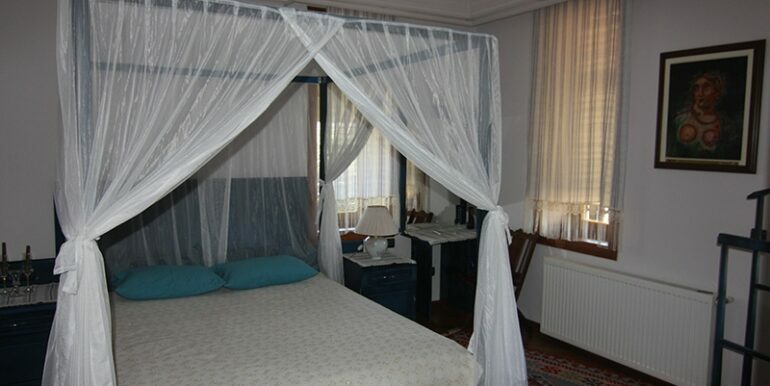 The villa is surrounded by an beautiful green garden with its own private pool surrounded by an sun terrace joined by a wooden pergola with a large typical Turkish built in barbecue. 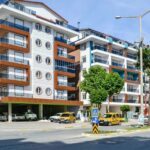 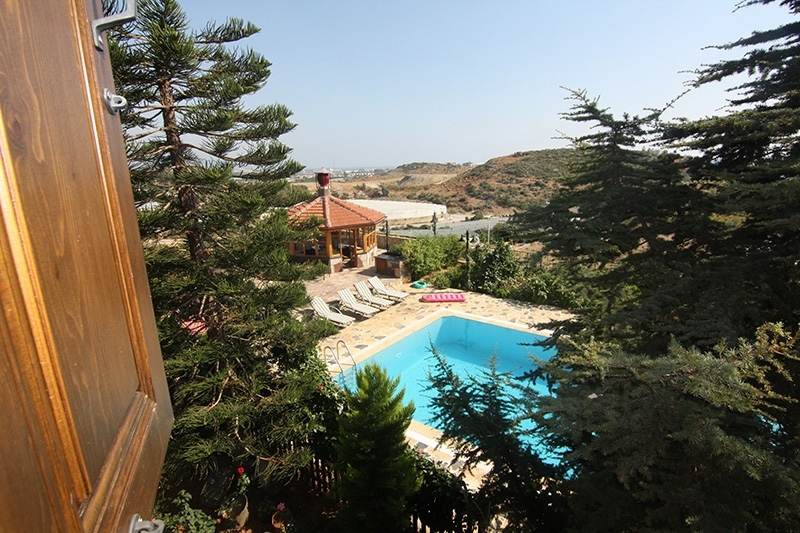 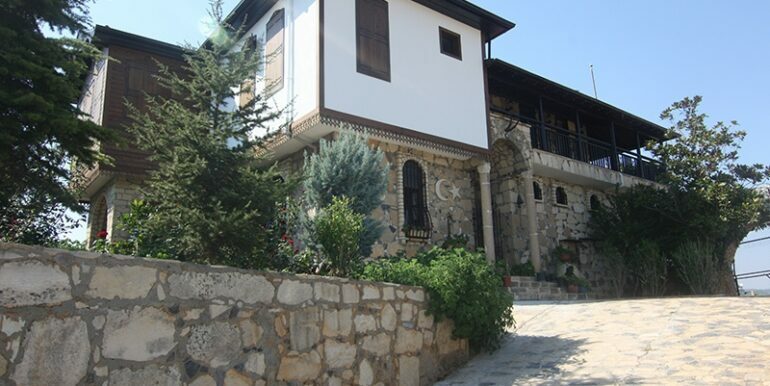 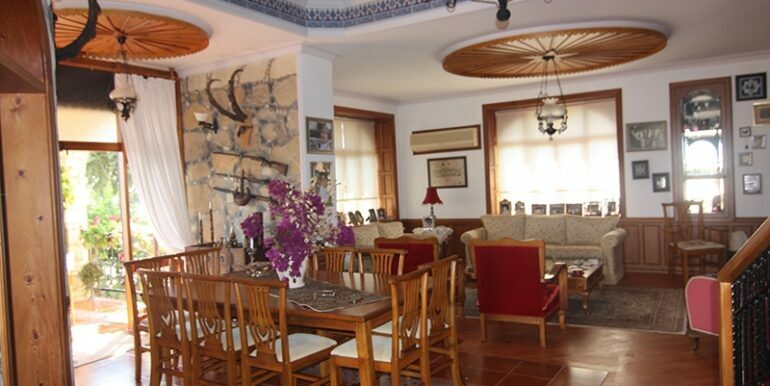 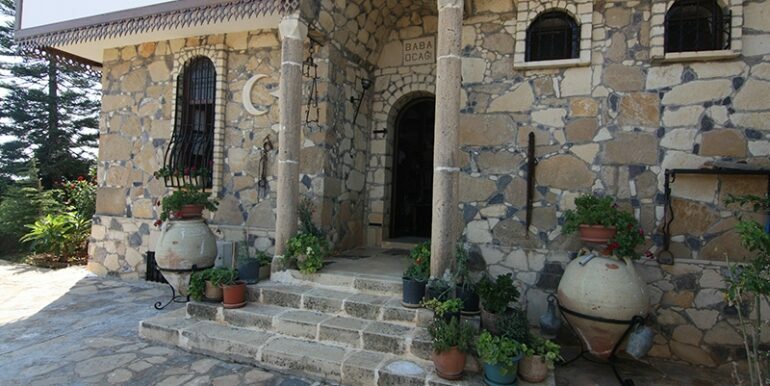 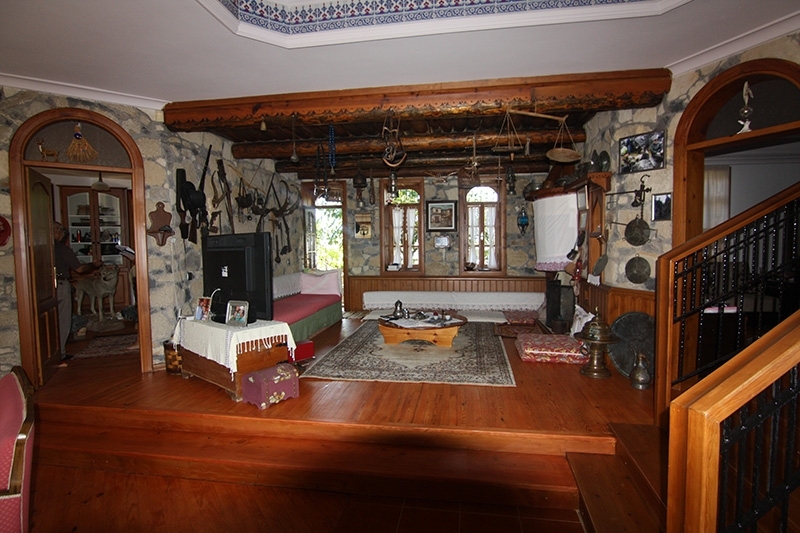 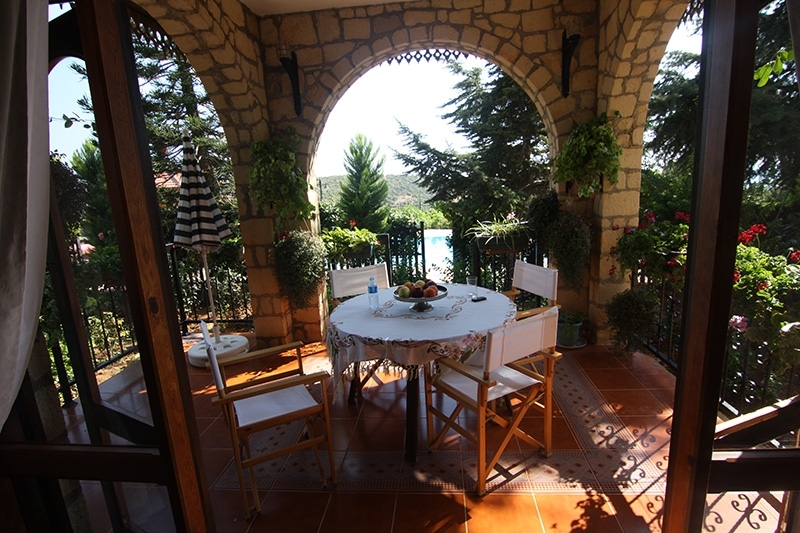 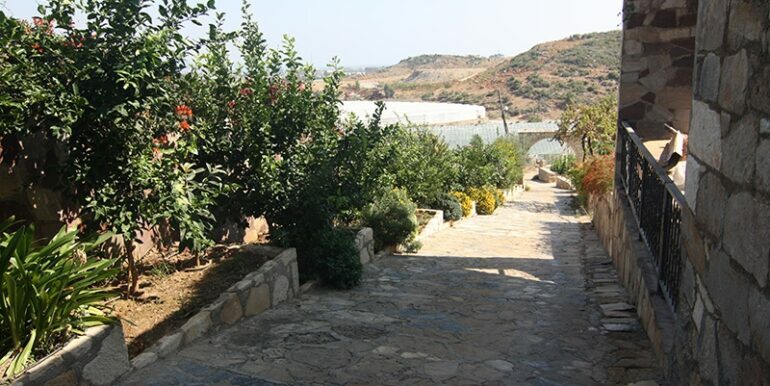 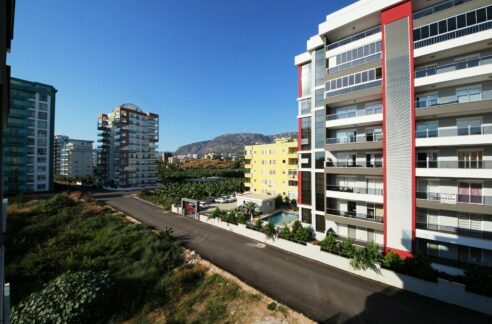 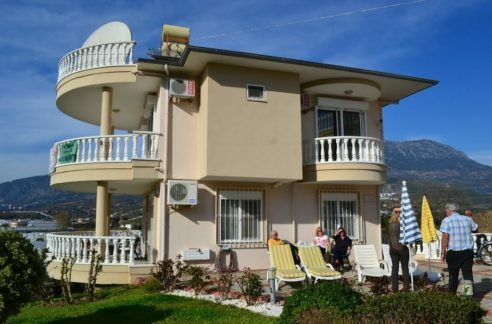 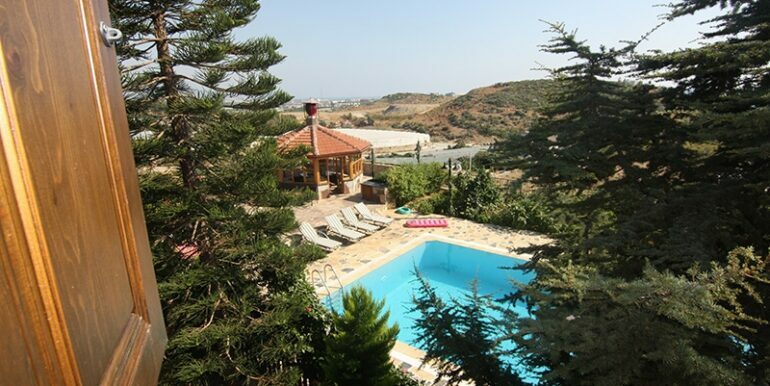 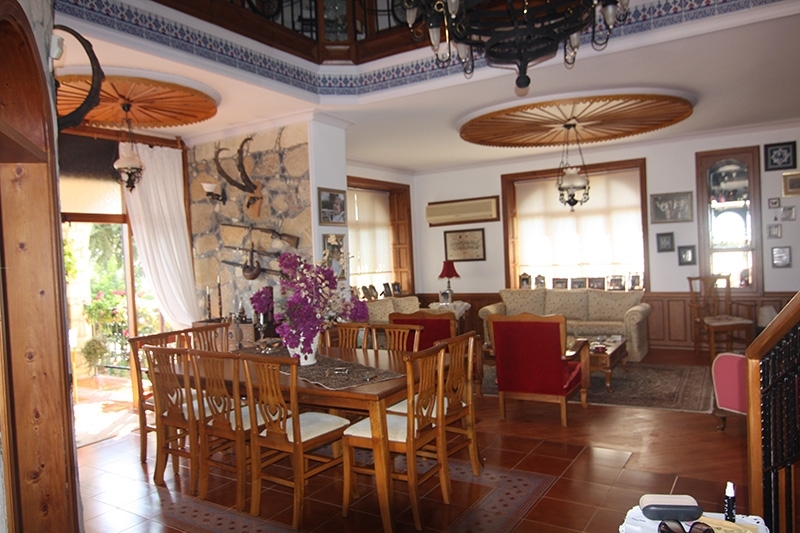 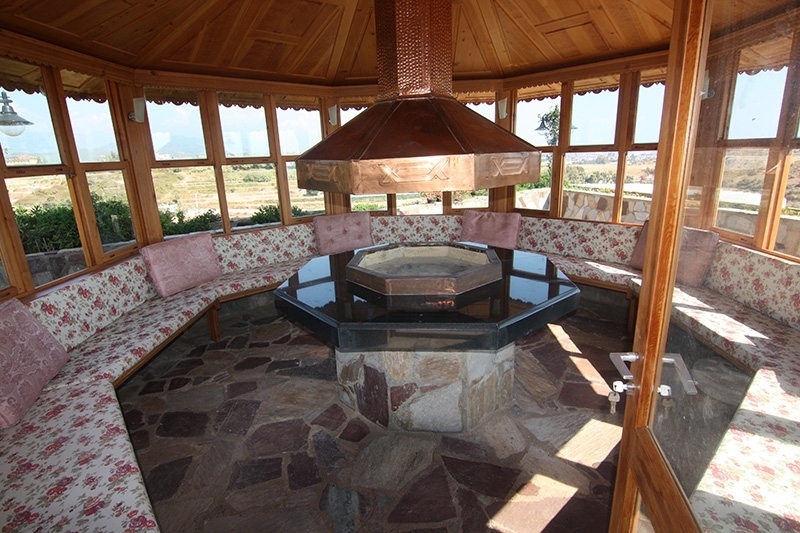 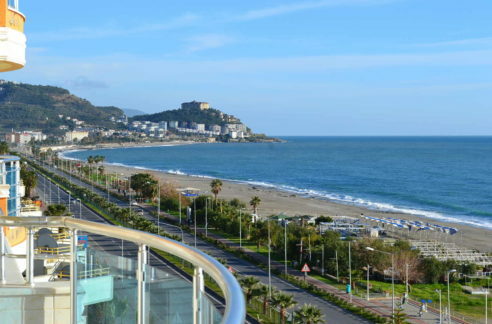 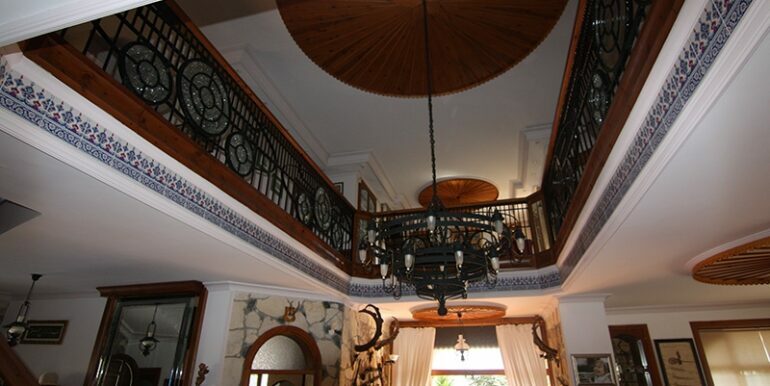 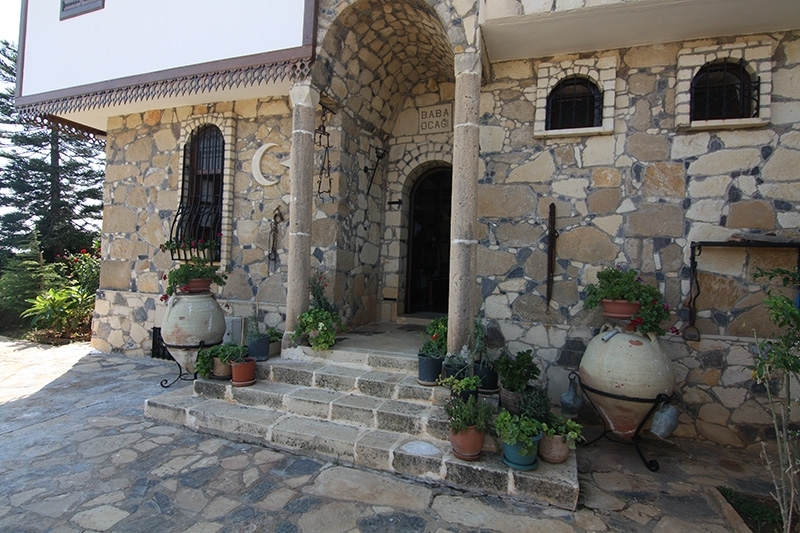 This type of villa is rare to find in the region, so if you are looking for a peaceful, quiet location offering incredible views of sea, mountains and Alanya near the sea then this is your house.